Cinco de Mayo: a day of celebration, remembrance, education, and margaritas. Originally a way for Mexican-Americans who were in the United States at the time to commemorate the Battle of the Puebla, when an outnumbered Mexican army crushed the French forces invading the country, it has since become a holiday dedicated to the celebration and education of Mexican heritage and history. And what better way to celebrate their culture than with a playlist of television shows and movies set in Mexico? Whether you’re looking for something to entertain your friends at a party or you want something to binge watch while you relax with a plate full of traditional Mexican dishes, we’ve got you covered. In honor of Cinco de Mayo, we’ve rounded up the best television episodes and films set in Mexico, perfect for enjoying alongside your gorditas, tamales and chilaquiles. We’ve even pulled an important lesson from each, so that you can learn while you laugh. 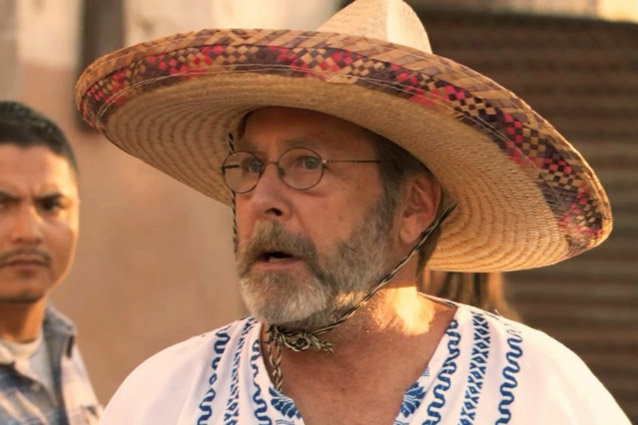 In this second season episode, Michael discovers that George Sr. has escaped to Mexico, and heads south of the border to track him down. However, G.O.B. thinks that Michael is the one fleeing the country, and sends a bounty hunter after him. After Michael has to double back to Mexico to pick up Ann (who got left behind in the ensuing chaos), G.O.B. confronts his brother about what he believes is a plan to leave the company. Meanwhile, Buster hides out in Michael’s trunk, intending to escape to Mexico to spite Lucille, only to end up at Lupe’s house, which he believes to be in Mexico. What This Episode Teaches Us About Mexico: You know the Bluth family’s infamous chicken dances? They’re considered to be a grave insult south of the border. Also, be conscious of where you park your stair car. Tenoch and Julio are two teenagers who meet Luisa, the twenty-something wife of Julio’s cousin at a wedding. To impress her, they invite her along on a trip to see la Boca de Cielo, the most beautiful beach in the country. When Luisa discovers that her husband has been cheating on her, she takes the boys up on their offer to see the beach… which doesn’t exist. They set out anyway, and the three of them go on a journey of discovery about themselves, their relationships and what the future holds for them. What This Movie Teaches Us About Mexico: There is no beach so beautiful it’s nicknamed the “Mouth of Heaven,” but there are plenty of other lovely beaches worth seeing – although you should maybe think twice before inviting that beautiful stranger to tag along on your road trip. Peggy takes the Spanish class she’s substitute teaching on a field trip to Mexico, where she quickly abandons the itenerary and takes the kids to a butcher’s shop. As the class is boarding the bus to head back to Texas, she forces a young girl named Lupe to get on the bus, thinking she’s one of her students. Because Peggy can’t actually speak Spanish, she doesn’t understand the girl’s protests, which results in her being arrested for kidnapping when she finally drives Lupe back to Mexico. Instead of using the defense that she doesn’t understand Spanish, and it was a misunderstanding, Peggy’s pride takes over. Luckily, her lawyer is smart enough to put her one th stand, where the jury can see just how little Peggy actually understands, and they let her off. What This Episode Teaches Us About Mexico: You really, really should learn a few key correct phrases before you visit. Or, at the very least, don’t force strange children to get on your school bus if they’re not actually your student. When a bandit named El Guapo begins terrorizing the Mexican city of Santo Poco, a young woman sends a telegraph requesting help from the heroes she saw in a movie, believing them to be real. The Three Amigos, who are actually actors, travel to the city, thinking they’re being hired for a show. They come face to face with El Guapo and his band of men, and rely on their Hollywood tricks to help defeat him. However, he comes back the next day with a full army, looking for revenge. What This Movie Teaches Us About Mexico: The people who live in Mexico are generally very friendly, and sometimes cunning and terrifying. Also, never trust the telegraph guy. He’ll edit your message and you’ll end up with actors instead of soldiers. After the son of a prominent businessman dies in a skydiving accident, Monk and Sharona are sent down to Mexico to investigate the suspicious circumstances surrounding his death. However, between his suitcases getting stolen, the imminent threat of dehydration – Monk, unsurprisingly, refuses to drink anything by the water he brought, which was in the stolen suitcase – and someone attempting to kill him, Monk might not live to see the investigation through. What This Episode Teaches Us About Mexico: If you’re a rich kid from San Francisco, you should spend spring break somewhere other than San Marcos, and it’s better to risk drinking the water than to almost die of dehydration in a foreign country. The story of the iconic Mexican painter Frida Khalo, the film traces her life from the accident that caused her life-long health problems at 18 through her death at age 47. As she recovers from the accident, she begins painting, and soon marries the muralist Digeo Rivera. However, their relationship is a tempestuous one, with both parties frequently engaging in affairs. Khalo later meets the Russian revolutionary Leo Trotsky, who was granted political asylum in Mexico, but shortly after Rivera discovers their affair and requests a divorce, Trotsky is murdered. During this time, her health began to deteriorate, and she was forced to amputated several toes and her left leg. What This Movie Teaches Us About Mexico: It wasn’t the safest place to hide out if you were a Russian Marxist revolutionary in the first half of the 20th century, although the vivid artistic culture kind of makes up for it. Set on the Mexican-American border, this FX series follows two detectives, one American and one Mexican, as they attempt to catch a serial killer who is terrorizing both of their jurisdictions. But in addition to catching a killer, Det. Sonya Cross (Diane Kruger) and Det. Marco Ruiz (Demián Bichir) also need to deal with the police corruption and drug cartels that are complicating things. What This Show Teaches Us About Mexico: Border towns are some of the most interesting cities in the country, as some elements of the cultures blend together seamlessly, while others keep the citizens separated. And no matter what country you’re in, every detective miniseries will feature the same character archetypes. Tulio and Miguel, two 16th century con artists, win a map claiming to show the location of the golden city of El Dorado by cheating at a dice game. In an attempt to escape, the hide on a ship that happens to belong to the explorer Hernan Cortes, and wind up in the fabled city, where they are mistaken for gods. In order to get their gold and get out of El Dorado, they need to rely on a local woman, Chel, who will help them maintain the illusion for her share of their treasure. What This Film Teaches Us About Mexico: The alignment of the stars is of vital importance to any proper tribute. Also, take some time to learn about the local culture so you don’t find yourself in over your head pretending to be an ancient god.